A beautiful specimen Japanese Maple (Acer palmatum) outdoor bonsai which displays fabulous spring and autumn foliage colour. An outstanding character bonsai with carved hollow feature trunk and beautiful branch structure. 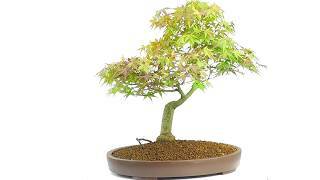 Potted into a very traditional classic Japanese style pot which gives this bonsai a fabulous finish. Please see the video beneath the main image for more detailing. Bonsai Pot: Unglazed oval bonsai pot.